Thanks to David Hanson for the following information. Nov. 2012. Halifax Bomber Crash At Galphay. When Royal Canadian Air Force (RCAF) airman arrived in England they were sent to training units, which in this case was 1664 Heavy Conversion Unit at Dishforth, where they are formed into crews and trained on the Handley Page Halifax. For most of the war the Candians did not train flight engineers (F/E) so the RAF supplied the F/E, so the usual crew of an Halifax was 6 RCAF + 1 RAF. For some reason the aircraft at Galphay had a crew of 8, with 2 F/Es, one RAF and the other RCAF. Why there were 2 F/Es and which was the regular crew member I have no idea. The Halifax, which was serial number JP204, took-off from Dishforth at 7.0pm on 1 October 1944 for a navigation exercise which must have covered most of the country. At about 01.50 the next morning they were preparing to land back at Dishforth. One of the F/E left his instrument panel to assist the pilot with the landing – what the other F/E was doing is a mystery. With nobody monitoring the instruments it was not seen that the oil pressure in the port outer Rolls-Royce Merlin had failed. The engine quickly overheated and caught fire.The pilot should have feathered the propeller to stop it turning, but he failed to do so. With the propeller windmilling it caused a lot of drag and the aircraft began to lose height and the engine started to break up. 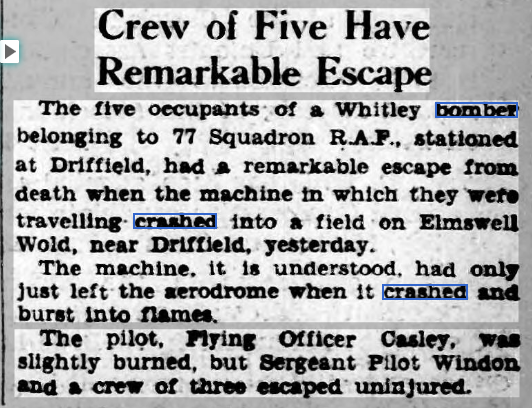 With the aircraft uncontrollable and obviously unable to reach Dishforth the pilot should have ordered the crew to bale out, but he failed to do so. But it was obvious to the crew what danger they were in and 4 of the crew baled out. But they were so low that 1 was killed when his parachute did not have time to open. The Halifax crashed at high speed half a mile west of Galphay, which I would think would be on Plover Hill Farm land, killing the remaining 4 crew. F/O Maurice Jack Hamblin. (Pilot), age 28 from Toronto, husband of Marjorie Florence. Sgt. Gorden Farrell Cummings. (Flight Engineer) age 23 from Toronto. F/Sgt Roy Smith. (Bomb Aimer) from Toronto, husband of Rosie May. P/O Clyde John Hogan. (Wireless Operator) from Upper Granville, Nova Scotia. F/Sgt Earl William Reid. (Air Gunner) age 18 from Pinkertoin, Ontario. All are buried at Stonefall Cemetery, Harrogate. A Bristol Blenheim crashed at Kirkby Malzeard on 23 October 1940, killing the Pilot. He was. P/O Peter Scott Hurst. age 20 from Hannington, Hampshire. He had taken part in the Battle of Britain before transferring to 600 Squadron at Catterick to train on Bleheims as a night fighter pilot. It is thought that he had became disorientated when flying in cloud and lost control. He is buried at Catterick. Extra research added June 2014. Reported in Yorkshire Evening Post May 10 1946. Bomber Crash in Yorkshire. A Royal Airforce Bomber crashed on the Tancred Estate, between Whixley & Linton on Ouse, this afternoon. Fire brigades were summoned from Harrogate, Wetherby & Boroughbridge. Report in Yorkshire Post & Leeds Intelligencer Feb. 1939. Thanks to Maurice Harland for the following memories. Air crashes at Grewelthorpe. Just through the gate on to the moor by Newlands a Hawker Hurricane crash landed ,and as lads we visited the site it was not too badly damaged but I remember the small rear wheel was adrift and Doug Lofthouse thought it would make a good addition to a wheel barrow and set off with it, however he was apprehended by an airman guarding the wreck and had to surrender it..in addition I remember at play time in school an Avro Anson flew over very low and landed in a small field in front of the little wood in front of what is Mr Trenholme’s farm. Again we all visited, and the pilot invited us to look inside the aircraft. A couple of days later he took off safely and departed. To look how small the field is it required some skill. If you have anything to add to this page please contact the site.